No.1 reliable company in the industry. Mizobata Chemical Inc. was founded as a dealer of textile machinery parts in early 20th century. Ever since we have been continuously working together with the industry dealing machineries like TOYOTA looms, Kanamaru sizers and so on. After advanced into sizing material fields, our business territory has been expanding globally. Now that, we have factories in Japan and Indonesia delivering our products regularly to 10 countries and areas globally. 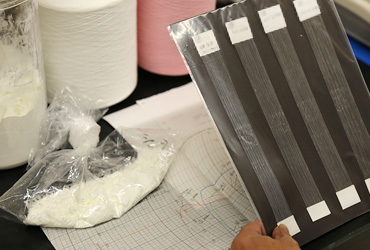 Fortunately, JETSIZE®, a perfect compound sizing agent developed by us, was well recognized as a top brand of compound size for spun yarn as the result of continuous effort in developing and improving our products to meet the changing market needs, such as speeding up of loom, diversification of textile materials and so on. In addition, our technical support team backed by a long experienced knowledge in this industry earns a good reputation from our valued customers, not only in Japan and neighboring areas like Korea and Taiwan, but also in ASEAN and South Asian countries, as the most reliable collaborator to find the problems and its solutions that arise or hidden in textile production. Besides the sizing chemical business, our factory in Japan has been dealing OEM production of powder mix products. Utilizing the know-how of powder handling and its QMS learnt in production of compound size, this business is also accepted favorably by the clients and the business field has been widespreading out of the textile sector to paper, building materials, detergent sectors and so on. 2019 is our 110th anniversary year from　the foundation. In order to celebrate it happily together with all the precious stakeholders, we aim to be a No.1 reliable company, being honest, diligent, with the motto of “Chase the Best”. Thank you very much for visiting us at our web page. We look forward to serving you at your factory. JETSIZE ® is the perfect compound sizing agent (Compound Size) which is mainly used for warp sizing of spun yarn. 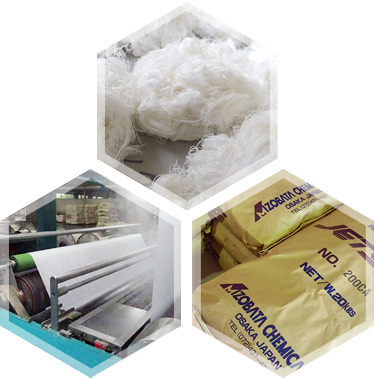 We have variety of products for any kinds of spun yarn for many usages and purposes. For customers, the general advantages of using compound size are to simplify the preparation process of the size liquor and to make the inventory control of sizing materials easier. In addition to these advantages, JETSIZE ® is a unique, high quality, performance oriented products that are made of carefully selected raw materials by our special mixing process, and has good reputation to apply for high speed air jet loom and to weave fabrics of high difficulty level. As we also focus on its usability, it is recommendable as the solution for production of many models in small quantities and human resource saving. Along with the R&D to keep and improve the competitiveness of JETSIZE ®, we also focus on pre- and after-sales activities to monitor the real situation of the customer, to optimize the performance of JETSIZE ®, and, as the result, to solve problems or achieve targets of the customers, by means of factory visit, technical support, sized yarn analysis test and so on. For more details, please do not hesitate to contact our technical support staff. Thanks to our reliable raw material suppliers worldwide and the long-term relationship with them, we can procure carefully-selected raw materials stably all the time. At the same time, we are continuously searching for the better new materials and studying the best application of them. Our unique and special mixing process produces a very stable and uniform products. Moreover, it has an incomparable wide range of adaptability to the diverse characters of materials to be mixed together, such as fine powders, granules, pastes, liquids and so on. Thus, we have a very big advantage of flexibility to make a recipe to meet the customers’ requirements both in selection of materials and in mixing proportion of them. We provide onsite and offsite technical support to all customers. In order to optimize the performance of JETSIZE ® and achieve the customers target efficiently, our technician visits factory before use to study the problem. After that, select the most suitable product, carry out a trial use and monitor the result together. Being with our customer during the PDCA cycle is our top priority. 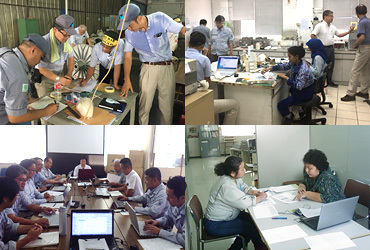 Besides these onsite activities, our experienced staffs support customer to monitor the progress of process improvement by testing physical properties of the sized yarn in our laboratory. We have a main factory in Kaizuka, Osaka, Japan and also have a subsidiary, PT. Mizobata Laju in Karawang, Indonesia. There, we produce products with the same quality standard. Both factories are located near the major producing regions of textile products and have been making efforts to develop products and provide services from customer’s viewpoint making use of the close communication with the customers nearby. Considering the each customers’ needs, we produce a right product at the right place, and supply the product and services speedily to the customer all over the world. Company　Name MIZOBATA CHEMICAL INC.
1950 Company is incorporated and capitalized at JPY1,000,000 - as Mizobata Shoten Ltd.
1961 Company changed its company name to Mizobata & Co., Ltd.
1967 Increase capital to JPY 10,000,000 -. Built a factory to increase production and improve product quality. 1983 Installation of R & D Laboratory for improvement of quality and customer service. 1989 80th year anniversary after foundation. Company changed its company name to Mizobata Chemical Inc.
1991 Installation of multipurpose powder blending machine, start production of Non-textile purpose blend products upon request. 2009 Installation of semi-automatic weighing machine for small quantity packaging. 2012 Installation of semi-automatic carton packing machine to improve efficiency of packing process. 2014 Installation of automatic weighing and packaging system to increase capacity of small pouch packaging. Add a special production line for Compound Sizing Agent in PT. 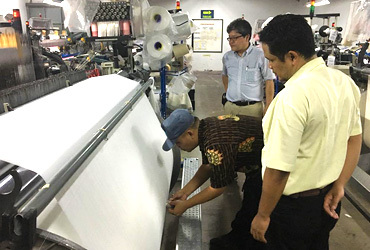 Mizobata Laju to increase production. 2015 Installation of Henschel Mixer to diversify mixing process. Please fill in below form and press “Submit”. © 1909-2018 Mizobata Chemical, Inc. All rights reserved.